@Sweetwrappings can provide your graduation party with some unique favors for attendees. We can customize wrappers with the names of the partygoers and give them the guests special party favors so they can always remember the party. Your guests at the graduation party will enjoy this dynamic and special wrapping that can be personalized and customized to your specifications. 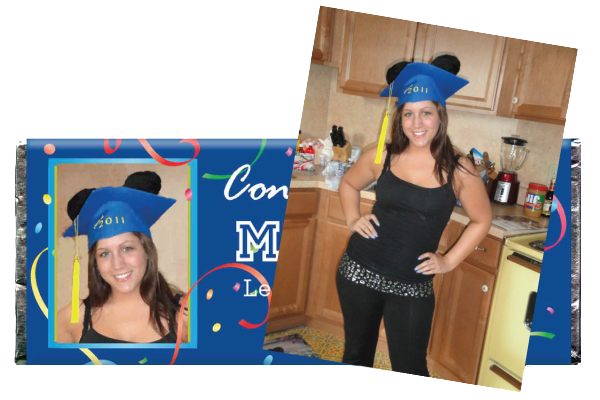 You can choose the special wrappers that will make your guests feel almost as special as the graduate. Choose our custom wrappers to make them feel special. This is one of the things that you can do and take advantage of when working with Sweet Rewards. You will get personalized customer service when you opt to contract with Sweet Wrappings so you can find the wrappers that will be perfect for your graduation party. Take advantage of these design professionals to make sure you get the wrapping you need for your candy bar. This is simply one of the things that Sweet Wrappings can do for you. Alternatively, you can go it alone and customize your own wrappers; it is totally up to you. You can use some of our custom designs or can get designs that are special and unique to you. Sweet wrappings is simply the service to use to get the wrappings you want when you need them. These wrappers are perfect for graduation party favors and many other events. The ideal thing about these wrappers is that individuals can choose to either buy, just the wrappers and purchase their own candy bars, or can have their choice of either Hershey's or Belgian chocolate bars. These are some super ways to find the wrappers and candy you need. The partygoers will be impressed that you took the time to think of them in a unique way. They came to pay tribute to the graduate and you salute them for their spirit of generosity. This is one of the great things that Sweet Wrappings can do. Use them for a great party favor graduation source. Honor your graduate and your guests with perfectly designed and uniquely inscribed wrappers from Sweet Wrappings. contact us for information in regard to price lists or anything you need to make the candy served at your graduation complete. Support your guests like they support your graduate with sweet rewards. for your brand while you support your favorite corporate charities. When you’re looking for something to donate for the goodie bags, think of custom chocolates. Your company may be a regular donor to the annual ball for your local hospital or you may be one of the sponsors for a new nonprofit art gallery. In any case, charities are likely to approach you for small gift items they can put in the tote bags they distribute to guests. Visibility: With your logo or custom message on the chocolate bar, guests will be sure to notice you. Otherwise, donors sometimes don’t even realize where the gift came from. Affordability: Chocolate bars are a great value no matter how big or small the audience is. They’re priced low but still look attractive. Shown below is how @humankindwater custom wrapped candy bar are used at their fund raising events. Transportability: People often leave behind larger items that they don’t want to carry. You don’t have that problem with chocolate. Your present may be consumed on the spot or people will take it with them. Flexibility: You can use one of our standard designs or create any message of your own. Think about providing the standard contact information for your company or add a special message unique to each fundraising event in which your company participates. The options are endless. Flavor: Of course, your gifts will also taste delicious thanks to our using 100% Premium Belgian Chocolate. That is something you can’t say about all those notepads or key chains. Contact us to turn an ordinary chocolate bar into a unique promotional gift or party favor. We’ve helped hundreds of businesses create new relationships through this creative approach to corporate events, marketing tools, tradeshows, sales promotions, and motivational and thank you gifts. Edible Party Favors! ~ What a Fabulous Finish! 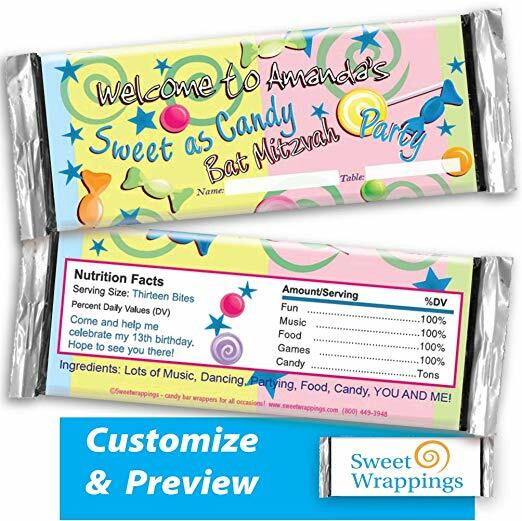 At your next occasion, use our personalized candy bars as trendy and unique custom edible party favor or souvenir. Wrap a Hershey bar with your party message, add your photos, and match your party colors. Guests like the idea of getting favors that are just that little bit extra special and personalized candy wrappers provide just that. Who doesn't love chocolate or candy? Now take that same delicious candy bar and add personalized wrapper and you've got an instant recipe for success. Do you love birthday parties, bridal showers and find weddings especially exciting? Do you love paying attention to all the little details that go into planning a great event, a unique 1st birthday party or that special anniversary? Present your guests with an exciting edible personalized party favor that displays your favorite photo. Make a “sweet 16" party even sweeter. Create a “theme gift" personalized edible treats for your next event or milestone birthdays such as 30th, 40th, 50th, 60th birthday party ideas. Candy bar wrappers from Sweet Wrappings deliver 100’s of designs that make elegant favors for any occasion. We will create the perfectly designed and personalized edible treats for your next event. Do you have a creative flair? Do you want to DIY (Do it Yourself)? Create your own candy wrappings for your occasion. You can personalize the front and back of the wrapper, even incorporate a childhood or heirloom photo into your own design. Your imagination creating the perfect candy wrapped party favor for a special event. Contact us with your own ideas! ~~ What could be better for your next party? Mix Business With Pleasure - Personalized Candy Wrappers! In today’s high tech, fast paced, media sensationalized world it can sometimes seem like a revolving door of advertisements. If you would like a different way to sweetly spread the word about your business, stop the spinning and open the door to Sweet Wrappings. Since 1999 we have been providing personalized candy wrappers, which are the perfect way to promote your company. These wrappers can be filled with chocolate bars for you to handout to your current - and future - clients and customers. With a myriad of designs to choose from, you can pick out a layout or you can create your own. Along with your own message we can even include photographs to give your wrappers a special touch. Look at our business gallery to peruse through our samples. Not only are they the perfect promotional item they are great for corporate events, office parties and holidays. Additionally, they are also an engaging way to say thank you to colleagues, employees and friends. Check us out #Sweetwrappings and see how chocolate bars can get all dressed up. They will no doubt leave a great impression, not to mention a great aftertaste! To order or for more information, please contact us and let us wrap up your business needs. I will remember what you have done for me - A Simple Idea! “thank you?” According to Merriam-Webster, the first known use of “thanks” occurred before the 12th century, but it didn’t exactly translate to “gratitude” back then. The word “thank” stems from the Latin word tongēre. The root tong- means “think.” Loosely translated, the expression might read “I will remember what you have done for me.” However, English is not the only language where “thank you” derives from Latin roots. THANK YOU is an expression of gratitude or politeness, in response to something done or given. Sometime the simplest things mean the most! Sweeten up that simple jester and say thank you to friends, family, customers, & employees or celebrate private holidays with custom candy bar wrapper party favors. 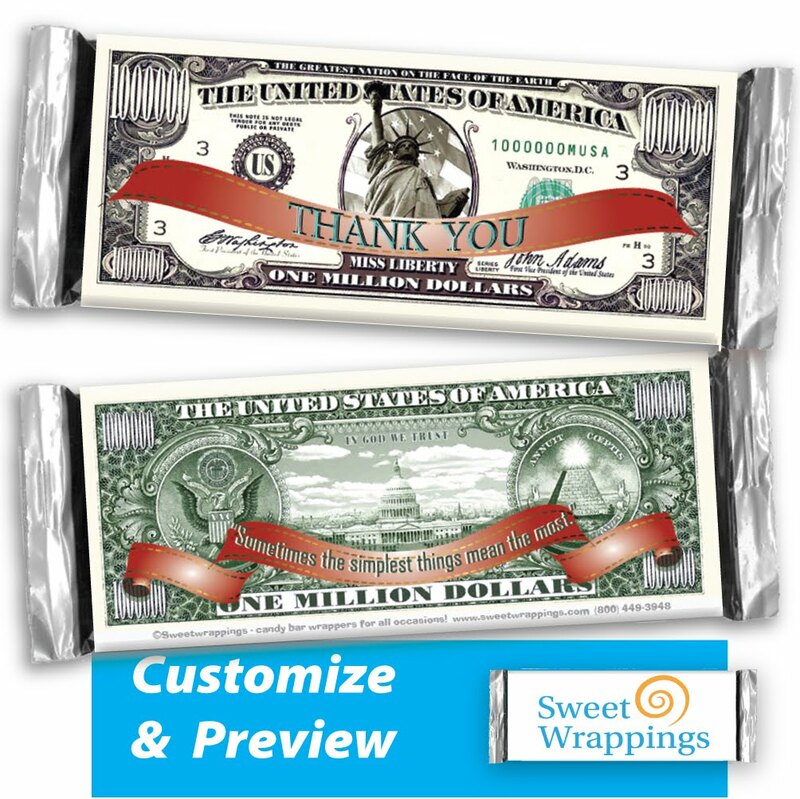 Add your own message to Lady Liberty Thanks a Million personalized Hershey candy bar wrapper, a logo or graphics or just a smile to the recipients. Personalized candy bar wrappers can turn an ordinary chocolate bar into something truly spectacular! #sweetwrappings and to you for spending a few minutes to read our post - Thank you! Christening Favors for Modern Families - Quick and Easy! It’s no secret that for many, christenings are a beloved and essential part of contemporary family life. As such, they are usually accompanied by a semi-formal or formal gathering that includes mementos for the guests. The good news is there are quick and easy christening favors that modern day parents may choose from. One quick and easy christening favor that parents may want to try involves filling tiny baby bassinets with custom wrapped Hershey’s miniatures. The mini wrappers could be decorated to look like the christening child. All the parents would need to do is obtain a clear photo of their child and have it printed onto the wrapper. If large christening favors are desired, there are other options. For instance, parents may want to create candy wrappers that include one or all christening symbols and use them to package full-size, white chocolate bars for each guest. At Sweet Wrappings, we have a variety of readymade Christian symbols on file that would work perfectly with full-size chocolate bars. They could easily standalone or be paired with scriptures and baby photos. In addition to serving as christening favors, custom wrapped chocolate bars could also be used to create table centerpieces. For example, a custom wrapped christening favor could be attached to the center of a floral foam cross. The rest of the cross could then be filled in with white, faux flowers. Afterward, the parents could place the each of the crosses onto individual stands and set one onto each guest’s table. Towards the end of the party, the family could play the penny under the tea cup game and award the crosses to the winner. If the game is not an option, the cross centerpieces could always be picked back up by the parents and distributed in another way. 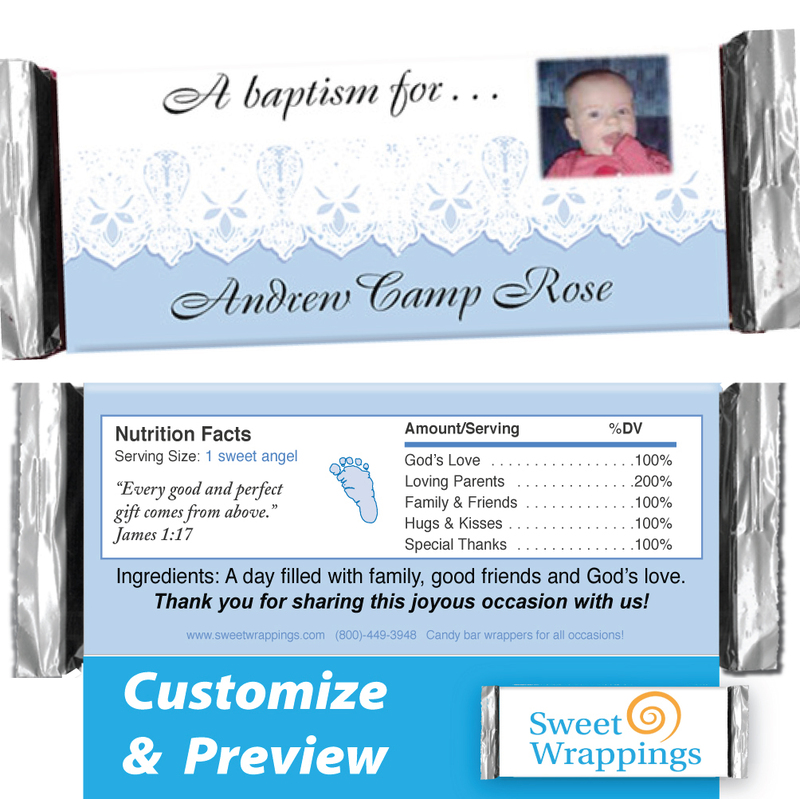 For more information about quick and easy christening favors like these, please contact us at Sweet Wrappings. Do you have a celebration or party planned for a child? A great way to personalize the celebration and make it fun and exciting is by ordering custom candy wrappers. It's a great way to customize the party and surprise the person the party is being planned for. Here are three occasions you may want to order custom wrappers for, along with some design ideas. What better way to surprise the birthday boy or girl than to set up the surprise party with wrappers saying "Happy Birthday!" and containing the child's age? You can create custom happy birthday wishes, and you can even create wrappers with the child's photo on it. You can even have a photo of your child as a baby alongside a recent photo, with a message to the tune of "How Much You've Grown!". Celebrating your child's graduation from elementary, middle, or high school will be a much more joyous occasion when you celebrate with custom wrappers. Order your child's favorite treats wrapped with congratulatory messages to let them know how proud you are. When your child reaches 13 years of age (12 years of age for girls), you may have the custom of celebrating this milestone with a Bar or Bat Mitzvah party. Whether the party will be held in a hall, synagogue, temple, Jewish Center or your house, you can spice up the occasion with custom-themed wrappers containing Bar/Bat Mitzvah messages and Jewish symbols. © 2016 Sweet Wrappings. Simple theme. Powered by Blogger.